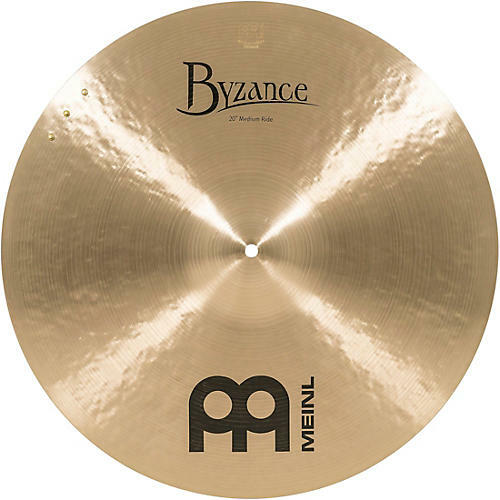 Meinl Byzance Medium Sizzle Ride Traditional Cymbal 20 in. Sizzles, along with the outstanding sound attributes of this medium ride cymbal, combine to form a shimmering sound with an extremely long sustain. Meinl's Byzance Traditional finish cymbals are handmade in Turkey using the traditional B20 bronze alloy. The profile of the cymbal is hand-hammered into shape. They are also lathed by hand. All this handwork goes into making a true musical instrument. These cymbals have a nice dark character with an explosive attack and a long decay. Good for Latin, jazz, rock, pop and country . . . a good all around cymbal.